Perlecan antibody LS-C15761 is an unconjugated rat monoclonal antibody to Perlecan (HSPG2) from human, mouse, bovine and other species. Validated for IF and IHC. Recognizes perlecan. Does not cross-react with laminin, fibronectin or dermatran sulfate proteoglycan. Species cross-reactivity: Human, bovine, pig, mouse. Suitable for use in Immunofluorescence and Immunohistochemistry. Not suitable for use in Western Blot. 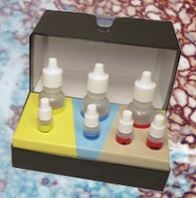 Immunohistochemistry (Frozen and acid-alcohol fixed): 1-2 ug/ml for 30 minutes at RT. Staining of acid-alcohol-fixed tissues requires antigen unmasking with 15000u/ml of bovine testicular hyaluronidase in PBS, pH 7.4 for 30 minutes at 37?C. Positive control: Tonsil.